GREENHORN: Journalist in training Nikita Gruzdev asks the tough questions. Tsunami storm survival, elite animal rescues, and high-speed helicopter exchanges are just a few of the many salty tasks left to the Santa Barbara Harbor Patrol. 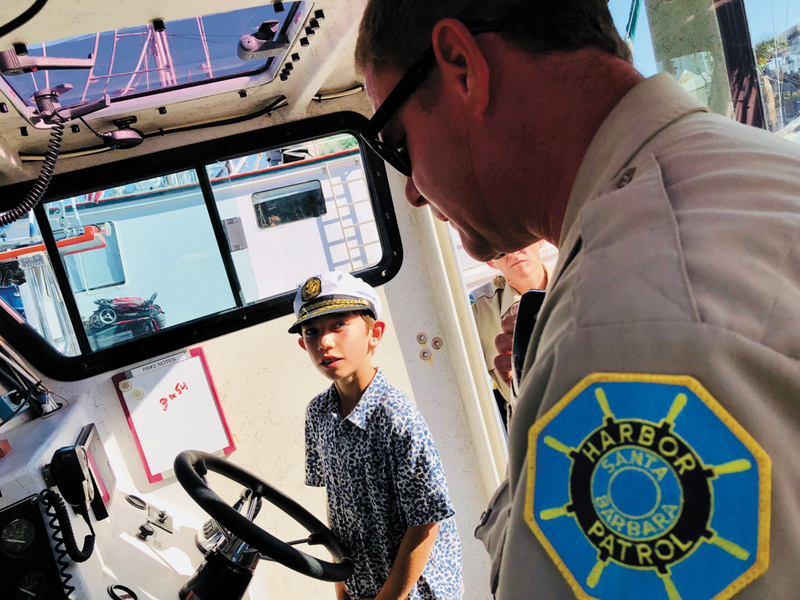 Optimist sailor and local 2nd grader Nikita Gruzdev, who is also my son, recently floated over to Harbor Patrol headquarters awash with questions for officers Jessica Gray and Ryan Kelly. Do you often save people if a boat sinks? We wear a lot of hats, but public safety is one of our main jobs. We have three boats that serve as floating fire engines and rescue boats. But we are also EMTs and have medical bags. We respond to medical calls in the harbor area and out in the water. And then we serve as law enforcement officers. There are people that live on their boats in the harbor full-time, so it’s kind of like a little city within a city. You’re too young to know what Mayberry is, but we’re kind of the county sheriff of the harbor. Have you ever been in a tsunami? Yeah, we have! A few years back there was a big tsunami in Japan, and it made it all the way here. Luckily, we had enough of a warning to tell people to get their boats out of the harbor, but we had water flowing in really fast and boats crashing into each other. It was chaos that day! Are you the guys flying the helicopters up the beach? No, that’s the Coast Guard, but they’ll sometimes do airlifts off our boats. They’ll hover right over our boats, and we’ll match speeds. You can just about touch the helicopter; it’s so close. Do you ever have to rescue animals? All kinds! I once rescued a horse swimming two miles off Summerland. A group was doing a photoshoot on the beach, and one of the horses got spooked and ran into the water. When we found him, he was extremely tired, so we fashioned a harness around its saddle and towed it an hour back to shore. That’s one thing about this job: You never know what is going to happen one day to the next. Do you have any dog or cat officers? You mean canines that work with us? Yeah. No. It was brought up once, but it’s not really practical for what we do. So we’ll leave that to the police department, and maybe we can borrow theirs if we need them.